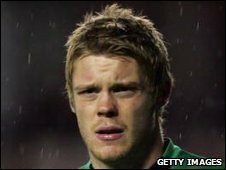 Bristol City's goalkeeper Dean Gerken was arrested in the early hours of Sunday, the club has confirmed. Avon and Somerset Police said a 24-year-old man was arrested on suspicion of indecent exposure after he was allegedly spotted urinating. In a statement the club said the player had apologised for his actions and the club has issued its own punishment. "As far as the club is concerned this matter has already been dealt with internally. "The matter is now closed," he added. Bristol City signed the former Colchester keeper on a two-year deal for an undisclosed fee in July.